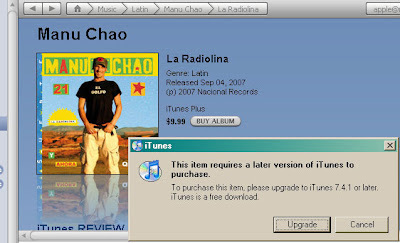 I went to buy the new Manu Chao album on iTunes. It turns out I can't buy it. My computer can buy songs on iTunes, as long as they are locked to my computer using a complicated "DRM" system. And until recently, my computer could also buy simpler song files through iTunes, the kind without DRM. But now Apple has cut the price on those simpler song files, and apparently the only software powerful enough to deal with the INCREDIBLE complexity of a price cut on plain digital files needs Windows XP or Windows Vista, Windows 2000 is no longer good enough, even though it could handle the older complicated DRM files. So if Apple wants to cut prices, it has to release a new version of its software, a new version so much more complicated it is incompatible with an entire operating system that ran the old version. I've bought 115 songs through iTunes on this computer, and now that the files are getting simpler and cheaper, suddenly my computer's not good enough. There's something deeply wrong with that. Hey Apple: Thanks for making my brand new iPod so much less valuable!